Stream up to 1080p. The film will be available to you for the next 48 hours. Stream and download in HD. Want more content from this film? This content is for your own personal, non-commercial use only. Read more. Use a different credit card Securely save my card to use later. A Paypal popup will allow you to complete your purchase. Sorry, this film can not be watched from your country. Our wish at Reelhouse is for its content to be available world wide. Certain criteria must be met before this can be made a reality, and we are working hard to make this happen. We want this as badly as you do. Stay tuned! What do you have to consider when starting a band? What is a manager actually doing? How do music media, band contests and other promotion strategies work? But most of all: Is there a formula for success? The film gives a clear answer to that, although that is to say that there are as many formulas for success as there are artists/bands. “Welcome to the Machine“ is a documentary analysis of the functionality in music business. This automatically makes the film a 100% documentary with comedy and drama, as well as 100% semi-investigative. In 12 chapters we're trying to answer the question what the every day work life of a music star looks like. But that is not enough. The young and ambitious band &quot;The New Vitamin&quot; tried putting all of these &quot;tips &amp; tricks&quot; from the above stars into practise. 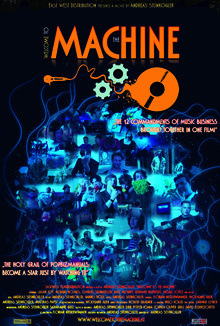 „Welcome to the Machine“ reveals the core of the music business machine. By Doing that, the film doesn’t care about genres or categorization. There are thousands of different music worlds but only one business. Not always serious but self-critical and above all ruthless – after all it is only about one thing: music. Although …..
1 Comment. Add your thoughts. Have something to say? Share your thoughts by commenting below.